Representatives from City have attended the 11th annual meeting of the World Class, World Cities (WC2) network that took place at the The Hong Kong Polytechnic University (PolyU). The purpose of the meeting was to discuss the ongoing development of the WC2 network and to develop detailed plans for the second WC2 Symposium. Following the meeting, representatives from the network attended a celebration of the 120th anniversary of Xi’an Jiaotong University. The WC2 network brings together top universities located in the heart of major world cities. The network allows its members to share ideas about how to respond to the various challenges faced by global universities located in major urban areas. The WC2 meeting was attended by 64 attendees from across the network, including five members of staff from City. This included Professor Stanton Newman, Pro Vice-Chancellor; Professor Stephen Cottrell, Associate Dean (International), School of Arts and Social Sciences; Professor Victoria Joffe, Associate Dean (International) School of Health Sciences; Dr Dirk Nitzsche, Associate Dean for Internationalisation at the Faculty of Finance; Professor Peter Ayton, Associate Dean Research & Deputy Dean Social Sciences and Mark Hertlein, Head of International Relations. Last year, City hosted the network’s inaugural Symposium, where staff and students from across the network gained new insights and built cross-University links for research and educational programmes. The 2016 Symposium will be hosted by the Technische Universität Berlin (TUB) from Monday 8th to Friday 12th August. The Symposium is aimed at postgraduate students and will explore the theme of Universities as Urban Actors: Towards the New Urban Agenda. After an introductory first day for all participants, specialist programmes on subsequent days will focus on the network’s five themes; Business, Eco-campus, Global Cultures, Global Health and Transport. 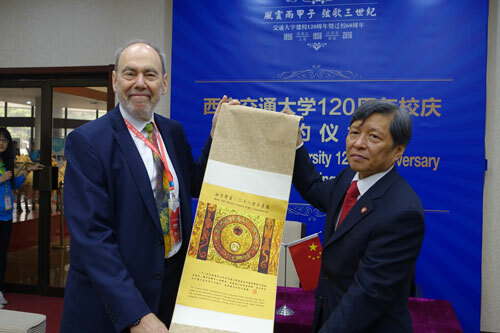 Professor Newman and Professor Ayton, joined representatives from other universities in the WC2 network to attend the Xi’an Jiaotong University celebrations. Xi’an Jiaotong University (XJTU) is one of China’s oldest universities and a member of China’s top nine leading institutions. Around 70 prestigious universities around the world were invited to attend the high-profile event, including the University of Oxford and Stanford University. The WC2 Network goes from strength to strength following its switch of focus towards an educational network that concentrates on building the experience of postgraduate students to gain a global perspective of issues that face cities in the 21st century. The Berlin WC2 symposium builds on the successful London Symposium where 150 staff and students attended from around the world. Members of the WC2 network were invited to attend the 120 year celebrations of Xi’an Jiaotong University which also provided an opportunity to network with universities colleagues from all parts of the globe. For information on the World Cities World Universities (WC2) network, visit the website or contact Mark Hertlein (Head of International Relations, International Partnerships and Development Office).